Welcome to the Embellished Body! 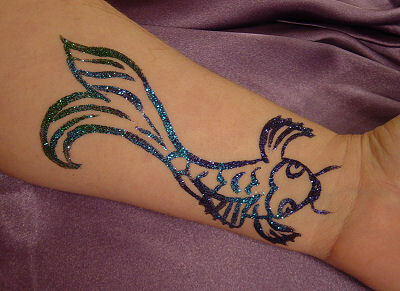 I am Sheryl, a henna and face painting artist serving the greater Kansas City area. Let me bring a sense of fun and excitement to your event, whether it’s a birthday party, corporate event or festival! Or just pamper yourself with a one-of-a-kind henna design! GIFT CERTIFICATES AVAILABLE! – What do you get for the person who has everything? A gift certificate for a henna appointment or party entertainment! Email me at sherylnd@yahoo.com to arrange it. You can see lots of photos of my work by clicking on “GALLERY“ at the top of this page or see more photos on Flickr by clicking on the sidebar to the right. Check the “RATES“ page for pricing information. Check the “CALENDAR“ page to see where I’ll be working. If you’re in the area, come by & get painted or henna! I’ll be adding more photos as time goes by, so please check back frequently to see all the updates! 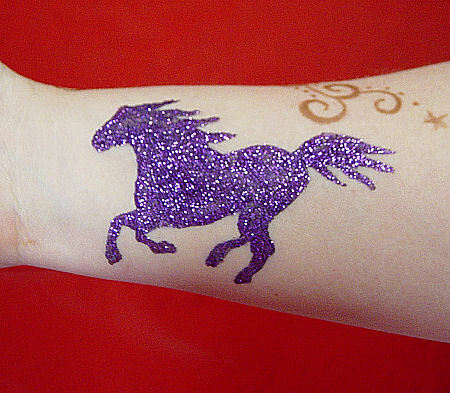 Glitter tattoos are sparkly designs done with medical adhesive and glitter, and they last about 2-3 days and they’re waterproof! These are attention-getting in a big way, and great for pool parties! Book an individual appointment or let me liven up your party, festival or corporate event!